Since some of us like hot food, I mean really hot, maybe it would be useful to know more about "the heat in food". There are many kinds of peppers and each have their degree of heat (hotness). Maybe we like hot food but not too hot, so by having a good knowledge of The Scoville Heat Units for every kind of pepper we plan to eat, maybe we can limit the damage that can cause a pepper to our palates. I never knew the difference between a Jalapeños, a Habañeros ,a Chipotle , a Pasilla or just plain ol' peppers. All I knew was that one was hotter than the other. A deeper study of the subject opened my mind to a whole new dimension for "Hot" peppers and would love to share this information with you or whoever loves hot, hot food and loves peppers. I have some examples of hot peppers here below but these are only a few of the really many types of peppers. on the Scoville heat meter. Please note that the above pictures and information are a courtesy of Wikipedia on Google. "How do you spell chili pepper? Is it "chili", "chilli", or "chile"? That's a great question! The name of peppers can vary from region to region, hence the different spellings. 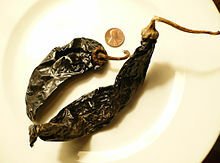 Depending on where you go, it is either "chili pepper", "chilli pepper", or "chile pepper". Take your pick! "Chilli" is more commonly used in England and Europe. "Chile" is by far the most commonly used in America's Southwest regions and New Mexico. "Chile" is actually the Spanish spelling and pronunciation of the word. However, "chili" is far more common in general usage and spelling, an Americanized spelling of the original "Chile" spelling that came out of Mexico." This paragraph was taken from the site: Chili Pepper Madness... on Google. For all intensive purposes, now that I know how to spell this word I will write it CHILI from now on in all my posts in order to be consistent. There was a gentleman by the name of Wilbur Lincoln Scoville (1865 - 1942) an American pharmacist/chemist best known for his invention of "The Organoliptic Test" now standardized as the Scoville scale to measure the piquancy or "hotness" of various chili peppers. The modern method for quantitative analysis, however, uses high-performance liquid chromatography making it possible to directly measure the "capsaicinoid content" of peppers. 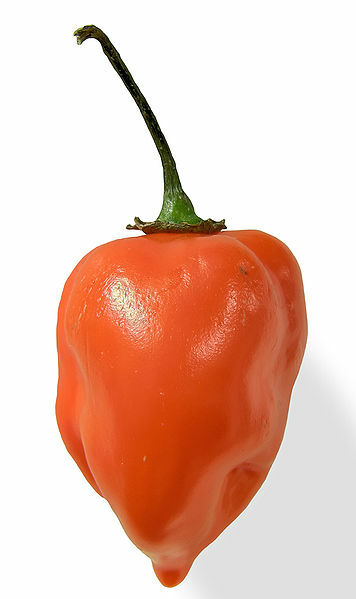 In other words, capsaisin is the active ingredient in genus capsicum plants such as Habanero, Jalapeño, etc. Therefore the Scoville Heat Unit (SHU) has been used to determine how hot a pepper is. 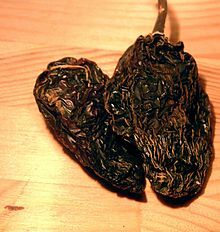 For example the simple green bell pepper has an SHU of 0, a Jalapeño has an SHU of 3000, a Habañero has an SHU of 300,000. Pure Capsaicin has an SHU of 16,000,000 units, Police grade pepper spray SHU is 5,300,000, common pepper spray is 2,000,000 SHU. So you can imagine, ladies, how well you are protected, if you have this with you at all times out of your home and get to know how to use it fast enough. Other known chilies which vary in hotness are the Poblano, Anaheim, Ancho, Banana, Serrano, Thai, Casabel and Pili Pili (Piri Piri or Peri Peri) from central Africa with an SHU of 185,000 units. Last time I was in Brussels I ordered mussels with Piri Piri which I could not eat. I am including a very interesting site for you to look at which I am sure will make you respect peppers because they really be mean to you. Funny enough, during my last visit to my physician, we talked about hot food and the fact that nearly all of the countries around the world which eat hot food are hot countries and rather poor. He told me something very interesting from his medical point of view that spicy hot food does not spoil as fast as food which does not contain any chili. This is because anything touching the peppers dies. This solved my question why do most hot countries eat very spicy hot food. Of course you know that hot food makes you sweat and the breeze will cool you down. Further surfing the internet, I stumbled onto a medical article about the benefits of eating chilies saying they are good for the health. They contain many antioxidants, and are good for some types of arthritis, and muscle problems. I hope you enjoyed this little introduction on peppers as much as I did. And...don't forget to make sure how many SHU your next hot sauce is because 185,000 SHU was way too much for me with the mussels in Brussels. !